The evidence for ‘Planet X’ – the mysterious hypothesised planet on the edge of our solar system – has taken a new turn thanks to the mathematics of a noted astronomer. Rodney Gomes, an astronomer at the National Observatory of Brazil in Rio de Janeiro, says the irregular orbits of small icy bodies beyond Neptune imply that a planet four times the size of Earth is swirling around our sun in the fringes of the solar system. 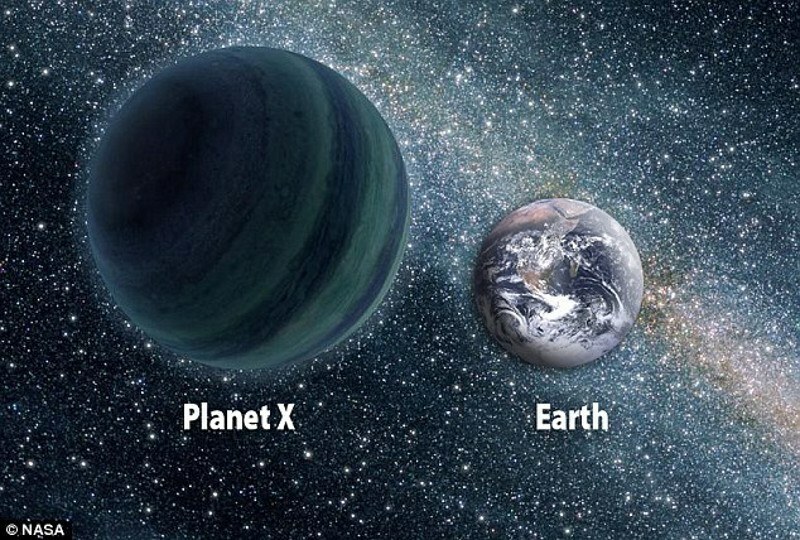 Planet X – perhaps mis-named now that Pluto has been demoted to a dwarf planet – has been widely hypothesised for decade, but has never been proven. Gomes measured the orbits of 92 Kuiper belt objects – small bodies and dwarf planets – and said that six objects appeared to be tugged off-course compared to their expected orbits. He told astronomers at the American Astronomical Society on Tuesday that the most likely reason for the irregular orbits was a ‘planetary-mass solar companion’ – a distant body of planet size that is powerful enough to move the Kuiper belt objects. He suggested the planet would be four times bigger than Earth – around the size of Nepture and would be 140 billion miles from the sun, or about 1,500 times further than the Earth. Alternatively an object the size of Mars on an irregular orbit that bought it to within five billion miles of the sun – close to Neptune’s orbit – could be the solution. However, due to the distances involved, it will be tough to for Earthbound astronomers to catch a glimpse of the hypothetical newest member of our solar system. Even non-planet Pluto is hard to spot thanks to the distances involved. While other astronomers are on the astronomical fence, they have applauded his methods. Rory Barnes, from the University of Washington told National Geographic that Gomes ‘has laid out a way to determine how such a planet could sculpt parts of our solar system. ‘So while, yes, the evidence doesn’t exist yet, I thought the bigger point was that he showed us that there are ways to find that evidence. Hal Levison, from the Southwest Research Institute in Boulder, Colorado, said: ‘It seems surprising to me that a [solar] companion as small as Neptune could have the effect he sees. The previous ninth planet, Pluto, is one of the largest of the Kuiper belt dwarf planets, at some 1,400 miles wide. It got downgraded by the International Astronomical Union in 2006 for failing to meet all the criteria of a ‘planet’, namely that its mass is not sufficient enough to clear its orbit of surrounding objects.